FIR infrared ray energy is a part of the natural light spectrum of sunlight, minus the skin damaging UV, which is why NASA spacecraft have utilized this heat. In Asia and Europe it has already revolutionized health and beauty products. Far Infrared ray is a form of light energy form the sun. It falls within the same family of Infrared Rays in the light spectrum, but due to its longer wavelengths human eyes, just like Ultraviolet Rays, cannot see FIR. The energy is ESSENTIAL & BENEFICIAL for all human beings. FIR has the ability to penetrate, refract, radiate & reflect. The human body can absorb FIR because of its deep penetrating ability. When FIR penetrates through the skin to the subcutaneous tissues, it transforms from light energy into heat energy. The thermal effect within the deep layers of tissues cause blood vessels in capillaries to dilate, promoting better blood circulation, and the heat produced helps to get rid of body toxins and metabolic wastes through sweating. What are the benefits of a FIR? If there was a way to increase bodily energy, lose weight, decrease stress, detoxify the body and purify the skin while elevating the immune system to fight off everything from the common cold, circulation, asthma, bronchitis and other respiratory conditions to serious life quality threatening illnesses, what would it be worth? What if all a person had to do to receive such benefits was relax and lay down for 15 to 30 minutes a day, three or four times a week, listening to music- now what would that be worth? Hundreds of years ago, people discovered and turned to heat therapy as a source of natural healing for many illnesses and discomforts. FIR heat is simply and naturally rising to the top of health regime requirements. Activated by heat, the FIR material emits FIR energy that is absorbed by human cells, causing a physical phenomenon called "RESONANCE". Thus, the cellular activities are instantly invigorated, resulting in better blood circulation and an overall improved metabolism. FIR heat therapy can aid in weight loss by speeding metabolic processes of vital organs and endocrine glands resulting in a substantial caloric loss in a heat session. In a case of injury, heat stimulates vasodilatation of peripheral blood vessels, bringing oxygen to joints and extremities, relaxation of stiff muscles, speeding the healing of sprains and strains. The increased blood flow helps aching and injured muscles recover faster because of the stronger blood flow and the quicker metabolic and toxic waste productions purged from the body through the skin during perspiration. The skin is known in Chinese medicine as the third kidney because it is believed to be responsible for eliminating up to 30% of body waste. FIR Heat Therapy allows increased blood circulation to carry great amounts of nutrients to the skin, thus promoting healthy tone, texture and mild cleansing of the skin. Infrared energy is not only safe, but also highly beneficial for our bodies. Far Infrared lamps are actively used for medical treatments by Doctors, Chiropractors, Acupuncturists, Physical Therapists, Massage Therapists for: arthritis, joint pain, stiff muscles, injuries to tendons and ligaments to promote a faster self-body healing effect. Radiant heat is also called Infrared Energy (IR). 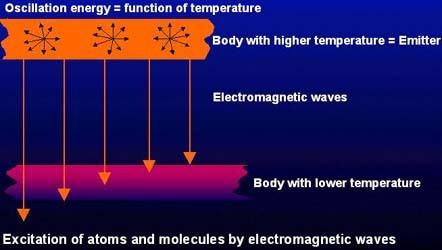 The infrared segment of the electromagnetic spectrum cannot be seen, but can be perceived as heat. Our atmosphere has a "window" in it that allows IR rays in the 7-14 micron range to safely reach the earth's surface. When warmed, the earth radiated infrared rays in the 7-14 micron band with its peak output at 10 microns. According to Dr. Tsu-Tsair Oliver Chi, in his summation on the mechanism of actions of infrared devices turned to the human body. Tissues needing a boost in their output selectively absorb these rays. The internal production of the infrared energy that normally occurs within our tissues is associated with a variety of healing responses and may require a boost to a maximal level to insure the fullest healing response possible in a tissue, which is being repaired. After boosting a tissue's level to its maximum, the remaining rays pass onward harmlessly. This phenomenon is called "RESONANT ABSORPTION".